In May 2001 we had the opportunity to travel to Ireland, the excuse being to visit our son who was an exchange student at Queens University in Belfast. We did all the touristy things, including taking the ferry across to Glasgow and the train from there to Edinburgh. 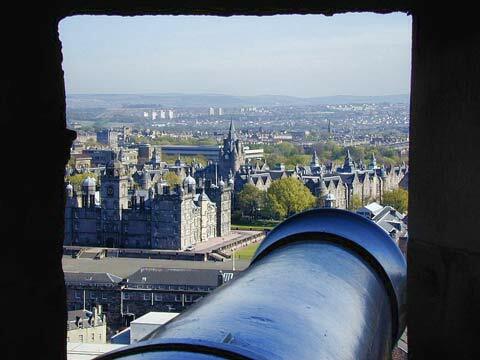 View through the cannon turrets at the Castle. Weeks before we set out for our travels, I did some genealogical snooping around because I had a strong sense that there were probably Irish roots somewhere in the family tree. And so when we first moved to Floyd in 1997 and my PT clinic was in the heart of town, I’d often wander through the cemetery across from the Floyd Country Store. 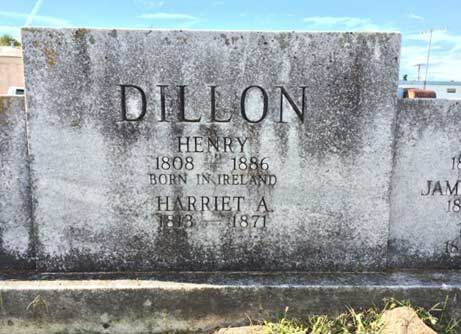 Here buried in tiny Floyd VA lies Henry Dillon, from Ireland, probably connected remotely to my mother’s father’s family from Murphreesboro, TN. And our first grandson, born to our son, is Henry Dillon First. Some of you will remember the immensely difficult situation of his birth in 2009. 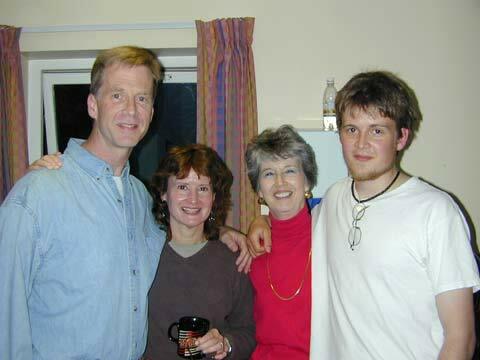 Beyond all reasonable expectations, he lives on, loved and cared for at home by his remarkable parents. Great story – and good to hear that Henry is with his family. Can’t believe it’s been six years. I have three Irish lines with different routes into Ireland: Murray came from the Scottish settlements, Bergin from the Viking invasions and Dinneen is an old Irish tribal name. All on the women’s side of my family, and Redman is not our true name. Another story entirely. If my memory serves, the Floyd Henry Dillon was an Irish architect/ builder who built some of the mansions in Floyd. We also made a migration to Ireland this past may. My grand mother was Queeny Dillon married Green Spencer. She was born 1881. Her father was George Joshua Dillon born in the USA 1851. His father was William Davis Dillon which I have found in the US cences 1850 born in Ireland 1821. That’s as far as I’ve gotten so far. Do any of these names sound familiar? We loved Ireland. It felt like home. Felt like home, indeed. It’s been almost 15 years since I did that bit of digging so don’t remember the links in the chair. I’d go back in a heart-beat, and also felt the same connection to Scotland. the number of castles did the Dillon family have in their name. Hello: I’ve prepared a 300= page history of the Dillons, from Dillon’s Country to today. More stories squeezed out of tons of old books, but also some trees and maps. Titanic crewman s in there as well as James Joyce and many, many others. Interested in getting a copy. May or may not be ready for Christmas. interested?